What’s a “superdrug”? And what can it do for your portfolio? Waiting on the Fed… golden eye candy… how banks create money (again? Ugh)… and more! Imagine a drug that could cure one out of five breast cancer patients. With both of those factors in mind, let’s explore what Paul rightly calls a “superdrug” — the first of its kind. For powerful, albeit anecdotal evidence, look no further than a website called Inspire, a social-media site where patients write about their experiences on new drugs. “I use Inspire to check on how a company’s drugs are actually affecting patients,” says Paul. And at Inspire, you find glowing testimonials. A common one: “I am NED!! !” That’s short for “no evidence of disease.” That’s considered a cure if you’re a cancer patient. “A cancer superdrug works just like a heat-seeking missile,” Paul analogizes. We can anticipate your objection: If the drug won FDA approval nearly two years ago, why is its maker a compelling investment now? Two reasons: First, Wall Street is underestimating the drug’s sales potential. “Wall Street analysts estimate the drug could generate sales of as much as $5 billion,” says Paul. “That’s going to make it one of the best-selling cancer drugs ever. This is a company, by the way, whose market cap is less than $800 million. Second reason: “The company has 22 superdrugs in testing,” says Paul. And Big Pharma companies want access to the revenues they’re bound to generate. “Big pharmaceutical companies are desperate for new drugs,” Paul explains. “The drugs they currently sell are going off patent. When a big pharmaceutical company’s drug goes off patent, a generic or knockoff drug is made available to patients. These generics or knockoffs are sold at a huge discount. For example, a 30 pack of the popular cholesterol-lowering drug Lipitor in branded form sells for $142. The generic or knockoff sells for just $22.50. As soon as the generic version was released, branded Lipitor sales tanked immediately by 70%. “As much as $200 billion of big pharmaceutical companies’ revenue is at risk in 2014 from generics and knockoffs. Two hundred billion dollars! That’s according to an expert research organization that specializes in tracking patents. Undervalued, and buyout bait to boot: No wonder Paul recommended these shares so enthusiastically to his FDA Trader readers last week. It’s still below his buy-up-to price. For access to all of Paul’s recommendations, follow this link. Stocks are treading water this morning, traders marking time until smoke emerges from the Marriner Eccles Building in Washington and the Federal Reserve issues its latest policy pronouncement. As we write, the Dow and the S&P are flat, the Nasdaq and Russell 2000 slightly in the red. “Now’s the time to get excited about computer storage again,” writes Jonas Elmerraji of a sector that sounds, well, unexciting. But before you nod off, know this: “In the last several years, every single computer storage stock I’ve recommended has been acquired at a premium,” says Jonas. Three of them, in fact. Average gain: 53%. “There’s a very good reason why computer storage stocks have been such big targets lately,” says Jonas… and yes, he’s eyeing his own buyout bait today. “The demand for storage is growing at a break-neck pace. It’s growing so fast, in fact, that an estimated 95% of all the data saved on computer networks today was created within just the last two years. And by 2020, experts believe that demand will reach 40 zettabytes — as recently as 2012, all of the data stored globally added up to just 2.7 zettabytes. That’s a staggering growth rate. The player Jonas has in mind is a fat target because it’s sitting on a huge patent portfolio. Few people outside the industry have ever heard of the company, but its collection of “intellectual property” ranks just below the likes of Hitachi and IBM. Jonas is keen on a select few Silicon Valley players that could deliver outsized gains before year-end… as he explains right here. 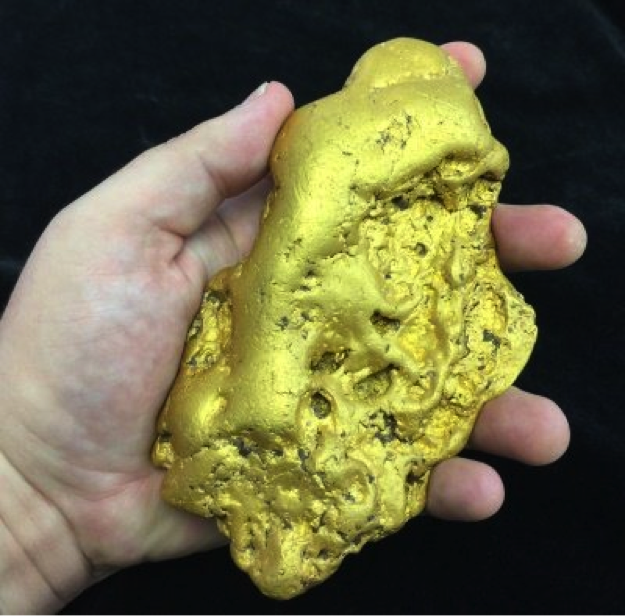 “Nuggets like this don’t come along every day,” says precious metals appraiser David McCarthy. The “Butte nugget” is named for the county in California where it was discovered only this summer. It weighs 6.07 pounds. “I really didn’t believe that I would see a California nugget of this size unearthed during my lifetime,” McCarthy says. “It is very hard for people to understand how our fractional reserve banking system works, and since it defies common sense, they are slow to accept it,” a reader writes. We’d better back up a bit: Late last week and early this, we got unwittingly dragged back into the matter of how banks don’t actually loan some fraction of their deposits. They issue loans and create brand-new deposits. “For those who believe that a bank only lends out a portion of the deposits they have taken in,” our reader goes on, “think about this. “Fannie Mae and Freddie Mac, at the height of the mortgage banking cycle in 2008, held a combined $5 trillion in outstanding mortgages. Then add mortgages held by other institutions, car loans, student loans and credit card debt and compare this with the amount of currency in circulation, M1 money supply, that could be deposited at a bank, which amounted to less than $1 trillion. “My ‘buts’ are not satisfied with your answers,” writes a persistent reader weighing in on two issues, including the loans-create-deposits matter. “With all due respect to the late Harry Browne [cited here on Monday], his illustration suggests that one borrows money at 6% interest to keep it in a checking account that pays 0.25%? If a lender deposits the loan proceeds into borrower’s checking account, it won’t stay there long but flow out to purchase the goods or services for which it is borrowed. The 5: Trust the New York Fed!? Which, when the Germans asked it to repatriate 300 metric tons of their gold held there, told them it would take seven years? We’re talking about an amount of gold that, as the Singapore-based analyst Grant Williams pointed out a year ago, could fit on three 747s. Again, we could dig into this all day, but have a 5 Min. limit to respect and readers we don’t want to bore to tears. Suffice it to say yes, power brokers in both the West and East are doing their best to make the physical gold trade as opaque as possible. P.S. Well, that was quick: Yesterday, Matt Insley issued an options recommendation to readers of Real Wealth Trader. This morning, he urged them to unload half the position — for a cool 74% gain. Real Wealth Trader is less than a year old, and it’s off to a great start. And the best is yet to come. Grab your share, starting right here.